Tony Scruggs was still swinging the bat in 1998, just like his old teammates Sammy Sosa and Juan Gonzalez, Scruggs told The Sarasota Herald-Tribune. Where they were doing it though was a little different. "Juan and Sammy are doing the same thing I am," Scruggs told The Herald-Tribune that September. "It's just that I'm hitting bombs in a fast-pitch softball league, but the feeling's the same coming off the bat." Scruggs spoke to The Herald-Tribune as both Sosa and Gonzalez, two of Scruggs' fellow outfielders in the minors, were having career years in home runs and RBIs. Scruggs' career year, his only year in the majors, consisted of six at bats and no hits. Scruggs' career began in 1987, taken in the seventh round by the Rangers out of UCLA. He played that first season in the rookie Gulf Coast League and at single-A Charlotte. He hit .337 between them, with nine home runs. He played 1988 largely back at single-A Port Charlotte, hitting .292 with another six home runs. In May, Scruggs hit a single and a triple, batting in four. In August Scruggs got three hits in another game, the same game in which Sosa hit two triples. Scruggs split 1989 between Port Charlotte and AA Tulsa, hitting just .195 in his half season at Tulsa. Back with Port Charlotte in August, Scruggs picked up four hits and a walk, with two RBIs, in one game. In a September game, Scruggs was credited with a run-saving sliding catch. After spending 1990 between single-A Gastonia and AA Tulsa, Scruggs moved higher for 1991. That April, higher was big-league Texas. Scruggs made his major league debut April 8, his final major league appearance coming less than two weeks later, on April 20. In that time, Scruggs got into five games, getting to the plate six times. He also scored a run. Scruggs spent the remainder of the year at AAA Oklahoma City, playing just 53 games there. He played just 58 games between Tulsa and Oklahoma City for 1992, his final year with the Rangers system. His final affiliated year came in 1993, with the Mariners. He played the year at AA Jacksonville, hitting .241 in 61 games. 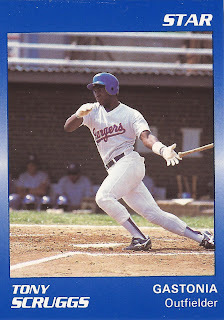 Scruggs finally finished out his career in 1995 in independent ball with the Western League's Long Beach Barracudas. It was with Long Beach that Scruggs' outfield work helped turn a home run into a double, but throwing back in a batting practice ball, after the real ball went over the fence.